The love affair with pickles begins when you first crunch through one, and notice how it transforms whatever you’re having with it. Meat, Seafood, cheese, charcuterie, breads and vegetables, our major food categories, have all benefited for having that sweet, sour, salty little mouth buddy along for the ride. Let me tell you though, the real fun begins when you grow your own produce, because when the plums are ready… Get out the pickling jars, jam pots, drying racks… Here comes the plum invasion! On that point, preserving your own home grown produce, or at least intimately knowing where it’s from and that it’s just picked, is one of the deeply satisfying food practices of any kitchen. Almost feels empty without that sort of context. So, if you haven’t got something growing just now, call your aunty who has. If she doesn’t have an excess in need of a bit of salt and vinegar… Pickle Her! Okay, so I didn’t grow the mushrooms. However, I did pick them with Annabelle in Dr Noel Arrolds amazing Mushroom tunnel in Mittagong NSW. Bring all of this to a gentle boil and leave aside to cool off and infuse. My mushrooms are a collection of Li Sun exotic mushrooms and include Shiitake, white, pink and yellow oyster mushrooms, shimeji, wood ear and Swiss brown. The above pickling quantity is enough for the equivalent of 4 or 5 punnets. 1 baguette cut at a slight angle into 2-3 bite croutons. Unless you’re Harry… 1 bite. ½ glove garlic for rubbing onto croutons. Pick over and trim off any hard stalky bits from your mushrooms and wipe off any debris that may be attached. Toss them gently and for about a minute continuously in the first amount of oil with the salt. The mushrooms will drink up the oil quickly, so the regular tossing will serve to distribute it well. Hopefully. Heat to extremely hot a heavy based frypan large enough to hold all the mushrooms at once (or do 2 batches) and toss them in. Sear them, turn them, sear again tossing and as you notice the mushrooms just beginning to “give” a little, tip them into the pickling solution. Put a weight (plate) on top to keep everything submerged until room temperature is reached. Store in the fridge for up to 10 days. Make croutons in the usual way and rub the cut side of the raw garlic across the hot surface as you take the crouton off the heat. 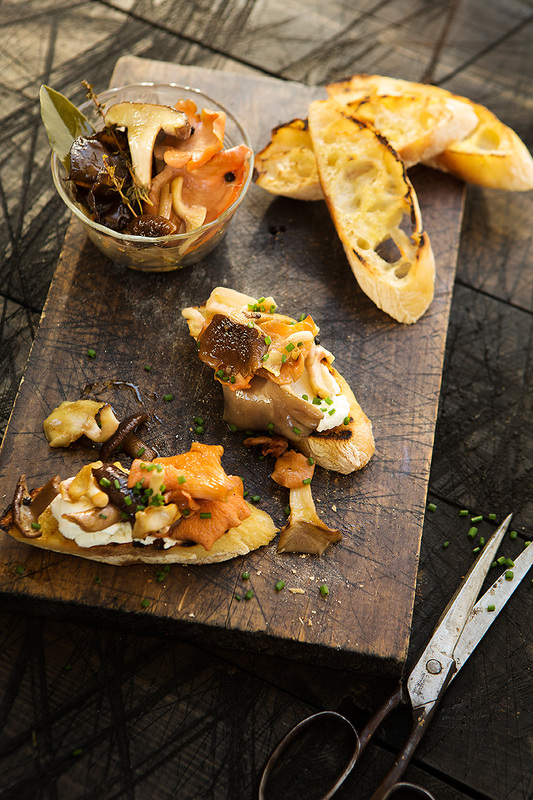 Smear some goat’s cheese onto each crouton, top with drained marinated mushrooms, sprinkle chopped fresh herbs on top as a garnish if you wish and hand around.